Instant, hydrated glow for all skin tones, for skin that’s good enough to wear bare. 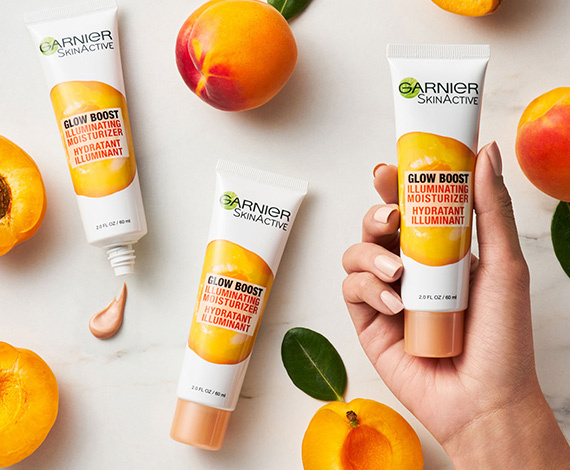 Formulated with 96% naturally derived ingredients, this illuminating, glow boosting face moisturizer with apricot extract gives skin an instant glow, without makeup. This moisturizing lotion blends seamlessly into all skin tones and has a sheer finish, leaving skin more radiant, brighter, and glowing. Skin will feel healthier, energized, and feels softer and more supple. This glow boosting moisturizer primes skin for makeup application and it can be layered with other products. Try this illuminating face moisturizer for instantly hydrated, fresh, healthy radiant looking skin. 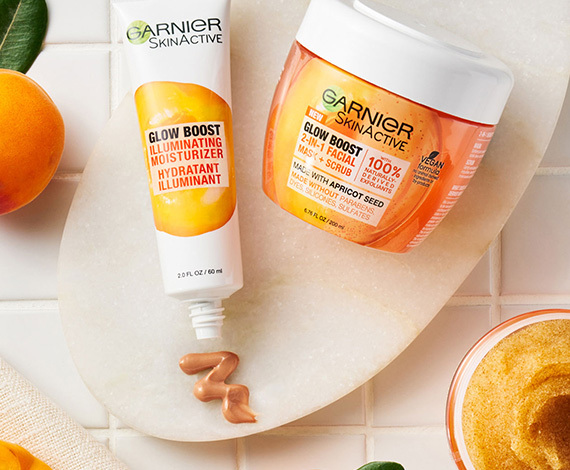 I love this Garnier SkinActive Glow Boost Illuminating Moisturizer it now my best moisturizer i have ever use i rcommended for those who havent try it . Garnier SkinActive has done a great job with Glow Boost Illuminating Moisturizer. Once I put on the product, I was left looking fresh all day. I really felt as if I was glowing and I looked like it too! 10/10 would recommend to anyone to buy this amazing product. Garnier SkinActive Glow Boost Illuminating Moisturizer is amazing!!! I thought it would be like any other moisturizer but I was pleasantly surprised. It gives your skin a nice glow and does a great job moisturizing my skin! I love that is buildable if you want to use it alone but it can also double as a primer. When I use it with my foundation I still get a nice glow. It’s a fantastic product that could literally take the place of several products. 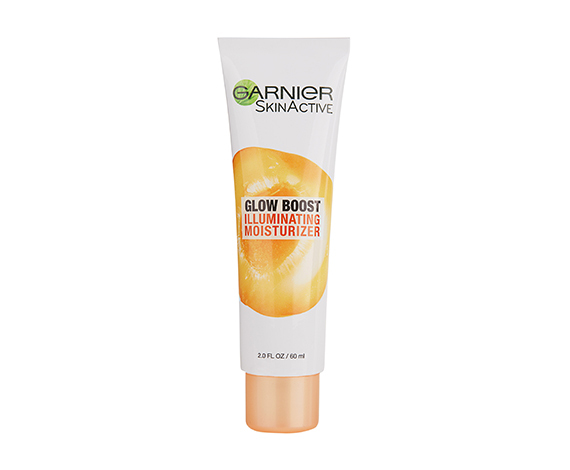 i was no sure about the product, because I have a sensible skin, but, when I open the glow boost illuminating moisturizer the peach smell was so soft and amazing, then with a little bit of the Garnier SkinActive I can refresh all my face and make it glow, not in a bad way, my face looks healthier. I received my Garnier glow boost illuminating moisturizer and I have to say I am pleased. I was glad that the sample is large enough to use for really several weeks depending on how often you use. I am an avid moisturizer user. I use a skin care line and apply in mornings and at night and spend quite a bit of money for my line. However, I will say that this is something I will use and look to when I am out of mine. I like the feeling on my fsve and that it's not overly thick. The smell is also really nice which helps when you're placing this all over your face. Love this moisturizer it keeps my face hydrated and gives it a healthy glow. It also feels very light on my skin and smells great! Love it! I received this as a sample and to be frank, it's quite nice on the skin. Not shiny or greasy. Just right amount of moisture and sheen to have a nice glow. Smells good too. Glow Boost Illuminating Moisturizer is great as a primer! It has a faint smell apricot it’s not over powering which good. Garnier SkinActive glowing moisturizer left my skin soft and was not greasy at all. It had no odor and blended well before foundation. Overall awesome product! I really like how the Garnier skinactive glow boost illuminating moisturizer smelled and made my face glow. Garnier skinActive's Glow Boost Illiminating Moisturizer os seriously a great product. I used this after my daily face cleani ng routine. Application was easy and it applied so smooth. It is tented on your hand but when you put it on it blends in seamlessly. My face felt smooth and looked really healthy woth the glow it gives. The smell i like amd it isn't a heavy product so i used it as a primer for my foundation. You get a lot in this and a little goes a long way. My husbamd said my skin looked great so thats a win for me. I absolutely LOVE the Garnier SkinActive Glow Boost Illuminating Moisturizer! I work at a gym so sometimes I don't get to do my makeup. But I have been using this and it leaves my skin GLOWING without all the makeup. It's perfect and easy to use! Garnier SkinActive Glow Boost Illuminating Moisturizer smells great and I love that it has 96% natural ingredients. I try to use more natural products because I have sensitive skin so this was awesome. I used it in addition to my moisturizer my dermatologist suggested and it did not break me out or have a reaction with my retin-a medicine! I absolutely love the Garnier SkinActive Glow Boosting Moisturizer!! It keeps my skin soft and hydrated, which I typically have trouble with. Although it's recommended as a base before makeup, I've used it without makeup and it still does a wonderful job. Definitely going to find this product and buy more! Always looking for a great all natural product like this and love this brand! Garnier SkinActive Glow Boost Illuminating Moisturizer is great! I immediately noticed the dewy look to my complexion. I also like how the product blends in to match my skin tone. It also has benefits for my skin. Garnier SkinActive Glow Boost Illuminating Moisturizer is better than I expected. Especially the sheer finished, I hate moisturiser is too sticky make me feel so uncomfortable. And it makes me look healthier. I received this garnier skinactive glow boost illuminating moisturizer complementary of pinchme && i have to save i LOVE it it goes on so smooth its not watery, it does not HURT my skin at all im shocked! Its smells amazing && i just feel soo refreshed!!!! Morning and night! The Garnier SkinActive Glow Boost Illuminating Moisturizer worked really well and I would definitely purchase! I liked the way it felt and was not greasy or smell bad. I received a sample of this product for free from PinchMe. The Garnier SkinActive moisturizer did not leave a heavy clogged feeling on my face. I would totally recommend the Glow Boost Illuminating Moisturizer to a friend! The Garnier skinActive glow Boost Illuminating Moisturizer was great really made my skin glow.